With what are Epson replacing the now defunct SP50 photo printer? Sorry, we only supply ink for Epson photo printers such as the Epson Stylus Photo R3000. Please contact Epson directly for information on the release of new printers and discontinued models. For the printer Epson Stylus Photo R3000 can you supply the ink kit No. 487? I couldn't find it in your list. Unfortunately, we don't list this item. We only supply genuine ink cartridges for the Epson Stylus Photo R3000 at this time. How do I put a cartridge into the Epson Stylus Photo R3000 inkjet printer? Do you sell UltraChrome inks for the Epson Stylus Photo R3000? Yes, all of the cartridges listed on this page for the Epson Stylus Photo R3000 printer contain original Epson ink with 'UltraChrome K3 pigment ink technology'. If you click on any ink cartridge on our website, this will take you to a new web page where you can view the product information for that particular cartridge. Is the black T1571 cartridge a genuine Epson ink cartridge for the Stylus Photo R3000 printer? Regards, Dave. Yes, we only currently only stock genuine cartridges for the Epson Stylus Photo R3000 printer so the photo black T1571 cartridge you need is the genuine Epson supply. Any item marked as 'Genuine' on our website is made by the OEM manufacturer and will be pictured in the official packaging. Do you ship to the US? If so, is there an added charge? Do you accept US dollar payments. What is the exchange rate? Thank you. Unfortunately, we are only able to ship to addresses within the UK. You quote the lowest price for five units. Can these be five different colours or do they have to be the same colour cartridge? Regards, Clive. The discount price for ordering five or more cartridges is only applied if you order five of the same item, so it does have to be five of the same colour. Are there any Epson Stylus Photo R3000 compatibles available yet? Unfortunately, at this moment in time, we do not sell compatible Epson Stylus Photo R3000 ink cartridges. If and when they become available, we'll update our website with the new products. Outstanding output and fast print speeds make the Epson Stylus Photo R3000 compact A3+ printer a suitable choice for professional and discerning amateur photographers, as well as graphic artists with an eye for quality and detail. The Epson R3000 photo printer also supports a wide range of media. This is why the Epson Stylus Photo R3000 is suitable for creative projects. The Epson Stylus Photo R3000 inkjet printer is integrated with advanced Micro Piezo AMC printheads complete with technology for ink-repelling coating. There is a separate tray for a CD or DVD disc, while the main paper input feed can take up to 120 sheets. The control panel lies on the right-hand front face side with simple buttons for ease of use. This model is fast, and the quality of photos and graphics isn't compromised despite the speed. High capacity inks mean that the Epson R3000 printer is relatively cheap to run, considering that image quality is of a high standard. The Stylus Photo R3000 can produce output on cut sheets measuring 13x19 inches, as well as speciality media like fine art paper. The printer can be shared by a small workgroup via Wi-Fi or Ethernet. The Epson Stylus Photo R-3000 is also praised for its user-friendly interface, intuitive software, and long-lasting output. 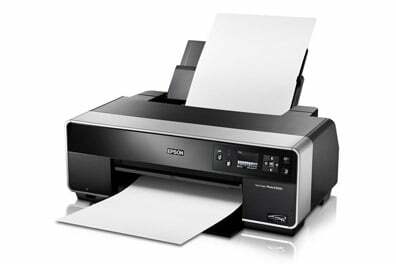 The Epson Stylus Photo R3000's large footprint might pose a problem to users with limited space. Disappointingly, the Epson Stylus Photo R3000 photo printer does not have the built-in card readers and PictBridge ports that most photo printers have.